The Office of the Prosecutor General of Ukraine denied the extradition request of Akbar Abdullaev by Uzbekistan, where he is accused of a number of economic crimes, his lawyer Oliver Wallash informed Fergana about it on 27 June. Akbar Abdullaev, 34, the son of Tamara Sobirova, the sister of the former first lady of Uzbekistan Tatyana Karimova, had already conviction in the past. “The extradition was denied for the reason of refugee status granted,” Oliver Wallash said in a telephone interview. As the Kiev city prosecutor's office confirmed, the status of refugee Abdullaev was granted two weeks ago by the decision of the State Migration Service of Ukraine. Now, according to Wallash, he continues to be in Kiev. However, according to Ukrainian legislation, refugee status does not prohibit him from leaving the country. “He expects to receive an official document on the refugee status under the Geneva Convention and after that he will be able to travel freely,” Wallash said. The criminal prosecution against Abdullaev began in 2012. In January 2015, the decree of the Tashkent City Court said that Akbar Abdullaev had been found guilty under three articles of the Criminal Code of Uzbekistan: a large-scale misappropriation or embezzlement, illegal acquisition and sale of foreign currency and bribery. The total amount of the misappropriation case was estimated at $800 million. Abdullaev was sentenced to 15 years of imprisonment, but after the appeal, the term was reduced, and as a result of three amnesties Abdullaev was released in late August 2016. President Islam Karimov died on 29 August (according to the official version - on 2 September) in 2016. 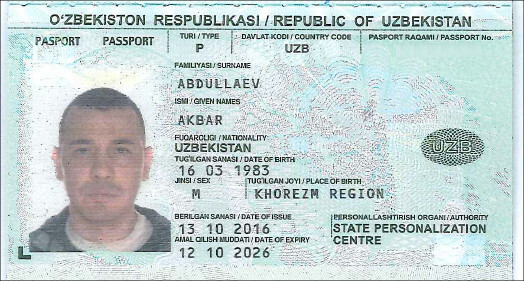 Abdullaev received a new Uzbek passport in October that year and left Uzbekistan. However, a month after his departure the Office for Combating Organised Crime and Corruption of the General Prosecutor's Office of Uzbekistan started new criminal proceedings: a large-scale misappropriation or embezzlement, concealment of foreign currency, forgery and legalisation of criminal income. Interpol issued a “red notice” at the request of the Uzbek authorities and Abdullaev was put on international wanted list. 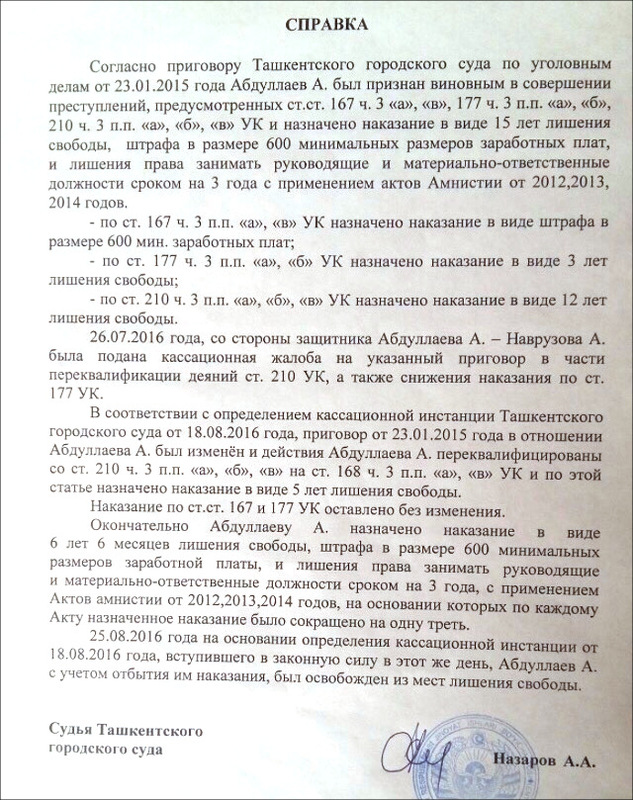 According to court materials, Abdullaev was detained at the Zhuliany airport in Kiev on 14 January this year. The “red notice” of Interpol activated during the passport control. He also had a passport of a citizen of the Dominican Republic. 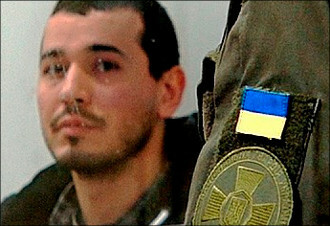 Two days later the District Court of Kiev sentenced Akbar Abdullaev to 40 days of arrest. Ten days later, on 26 January the Ukrainian side received a request from the Uzbek Prosecutor General's Office about his extradition. Then the case went to another District Court of Kiev which ruled that Abdullaev remain in custody in February, and extended the extradition arrest for 12 months from the day of his arrest in April. At the same time, Abdullaev applied for protection in Ukraine and refugee status. While giving evidence at the hearing on 22 February Abdullaev said that during his detention in Uzbek prison he was repeatedly subjected to ill-treatment. 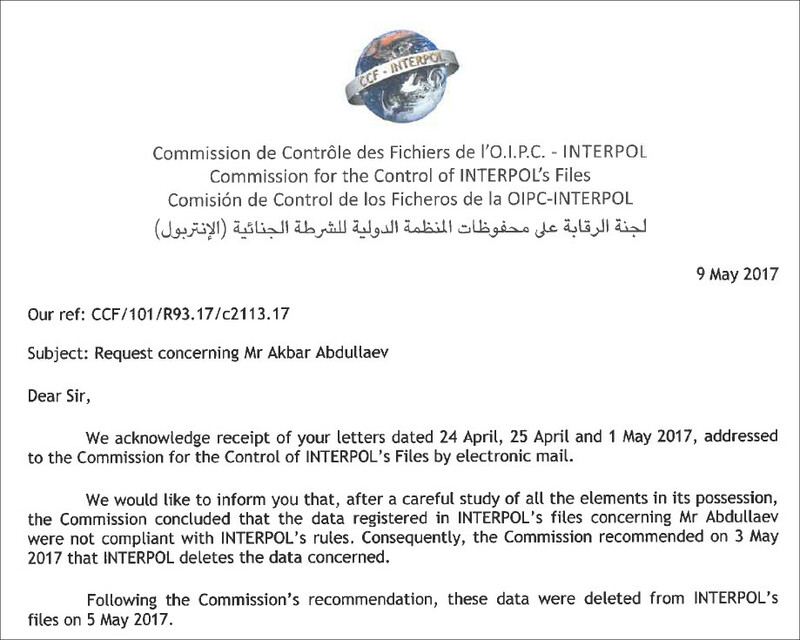 In early May, the “red notice” and the data about Abdullaev were removed from Interpol's base. A copy of the document dated 9 May 2017, which is in the possession of Fergana, states that this happened on the basis of three appeals from lawyer Oliver Wallash to the Interpol Commission monitoring files. According to information available to Fergana, Akbar Abdullaev and his mother, Tamara Sobirova, controlled the following industrial enterprises in the Ferghana Valley of Uzbekistan: Ferghana Oil Refinery, Kuvasai Cement Plant, Fergana Textile Company, Silver Silk Factory, Quartz Company, Kuvasai Textile Company and other large enterprises, dozens of shopping complexes, as well as a network of “Asia” hotels in different cities of the country. In 2016, the Baltic Center for Investigative Journalism in Latvia Re:Baltica published an investigation into the business of Abdullaev in Latvia, where he moved in 2006. According to the article, Abdullaev purchased two hotels in Riga with a total cost of 18 million euros in 2007-2008. He was in partnership with the Latvian businessman of Afghan origin Gulam Gulami and his wife Valentina. Gulami was also close to Abdullaev’s cousin and the youngest daughter of Islam Karimov - Lola Karimova-Tillyaeva. Re: Baltica journalists also found Abdullaev's real estate in Latvia - a house worth 1.4 million euros, a Bentley car worth 200,000 euros and an apartment in the historic part of Riga worth at least 300,000 euros. In 2012, the Latvian police started criminal proceedings against Abdullaev regarding money laundering, but the case was not completed. In Latvia, Gulami is still under investigation about fraud with the ownership rights on one of the hotels also owned by Abdullaev. We will continue to tell about Akbar Abdullaev in our future materials.